Five-year-old Janna Justo, right, and her brother Jeron picked up baskets full of fireworks yesterday at Don Quijote on Kaheka Street as their mother, Jennifer, holding baby Ronald, looked on. For Manoa resident Manny Kau, setting off fireworks to scare away evil spirits on New Year's Eve is a tradition that he takes seriously -- to the tune of $400 in fireworks on the first day of sales. 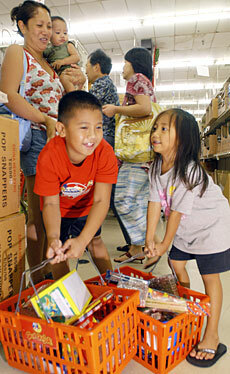 "This morning I had to rush and carry what I could out of here," he said yesterday at Don Quijote in Honolulu. "That's all my cart would carry." After finishing work, Kau returned to pick up sparklers and fountains for the kids, adding to the thousands of firecrackers he had already bought. While residents steadily bought up fireworks on the first day of sales yesterday, city officials said sales of firework permits have fallen and are heading for at least a two-year low. "Big drop," said Eric Kimura, assistant chief of the Satellite City Hall Division of the Department of Customer Services. "I think it's because of the popularity of the newer version, the paperless firecracker. That way you don't need permits." Permits cost $25 and are required for regular firecrackers. They are good for up to 5,000 firecrackers, and an unlimited number of permits can be purchased. Novelty fireworks, including paperless fireworks and fountains, can be bought without a permit. By Monday, Honolulu residents had bought 3,546 permits this year, down from 5,001 at the same time last year. At the end of 2006, a little more than 10,000 permits were sold. "Looks like its going to be less than 10,000," Kimura said. "It's going to drop from last year." At Don Quijote in Waipahu, firecracker sales were steady, said store manager Ed Sawai. "We're getting sales from both sides, permit crackers as well as the nonpermit items. It seems like there is more action in the nonpermit section," he said. Paperless crackers, which leave less rubbish and are not as loud as traditional firecrackers, were dominating the nonpermit sales, he said. "It's the closet thing to the permit firecrackers," he said. He said the store ordered more fireworks of all kinds to keep up with sales last year. Guy Takamori of Mililani stopped by the Honolulu Don Quijote after work and had his arms full with novelty fireworks. He is buying only nonpermit firecrackers this year to save on the cost of the permit and the regular fireworks. "Plus these, less rubbish," he said. Kimura recommended those needing a permit to purchase it sooner to avoid long lines. Residents have until Monday to purchase a permit at any satellite city hall, except the Hawaii Kai site, which is closed on Monday. Fireworks can be set off from 9 p.m. New Year's Eve to 1 a.m. on New Year's Day.